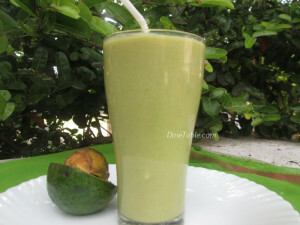 Avocado Green Tea Power Shake Recipe is a complete booster for fitness lovers after their post work out. This recipe is for those who are very conscious about the balance of food and fitness in their daily life and who are great food admirers. This is absolutely sugar free drink. Avocados is an excellent supplement of a variety of vitamins and good source of healthy fats (monounsaturated and omega-3s), which help the body to absorb fat-soluble vitamins (like A, D, E) and carotenoids, a type of antioxidant. A type of catechin found in green tea, epigallocatechin gallate (EGCG), is said to increase resting metabolism and stimulate fat-burning. Green tea extracts are rich in polyphenols and catechins, to be useful for obesity control. This is indeed a healthy and nutritious sugar free drink. Hope you all try this Avocado Green Tea Power Shake Recipe. Enjoy and stay healthy. In a small bowl, whisk matcha powder and hot water. Mix until it is dissolved and keep it aside. Cut avocado into pieces and make into a paste with the help of a blender. Add yogurt, protein powder and sweetener into it. Add almond milk and matcha tea mixture and blend it until smooth. Pour the shake into the serving glasses. Tasty Avocado Green Tea Power Shake is ready to serve.